We’re back in Jogyaarta, a town in Central Java I’ve been coming to for over 30 years, and we’ve met up with an old friend from those early years. I first met Niken when she was at Gajah Madah University studying English and we were buying batik pictures from her mum’s little shop on Gang I. When my boys were little we would sit and chat while they raced up and down the alleyways with the neighbourhood kids, and we got to know Niken and her brother Didik well over the years. Niken was in love with an American guy studying agriculture but her Mum (who was old fashioned that way) was against them marrying. When Didik married his girlfriend Naning and their mum became ill, she relented, but by now it was too late. Niken and her lovely American boyfriend never got together again and she has never married. 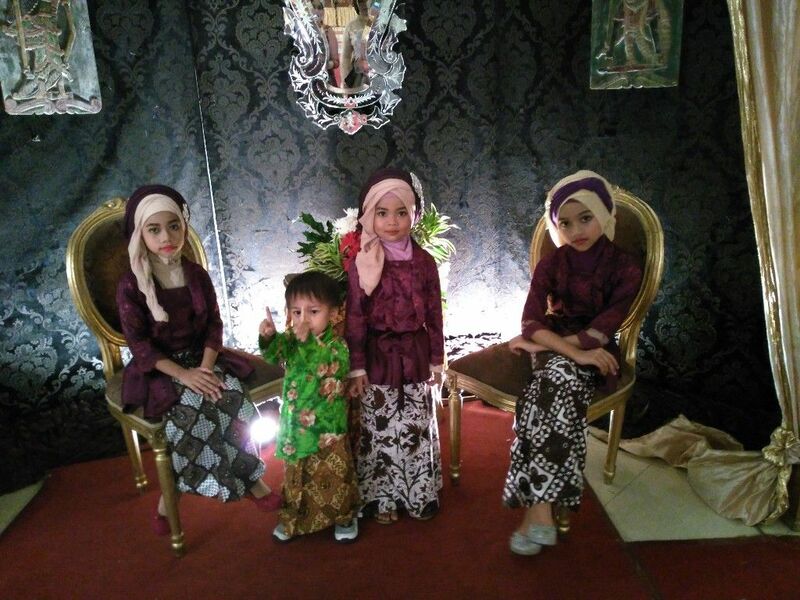 Didik sadly died at a young age, and after his death, Niken took on the shared parenting of his three young daughters alongside her sister in law. She is now an eminent professor of English Literature at her old University.Twenty years ago Jim and I and sons Shay and Sean were invited to Naning’s sister’s wedding at the family’s home in a village out in the rice-fields. 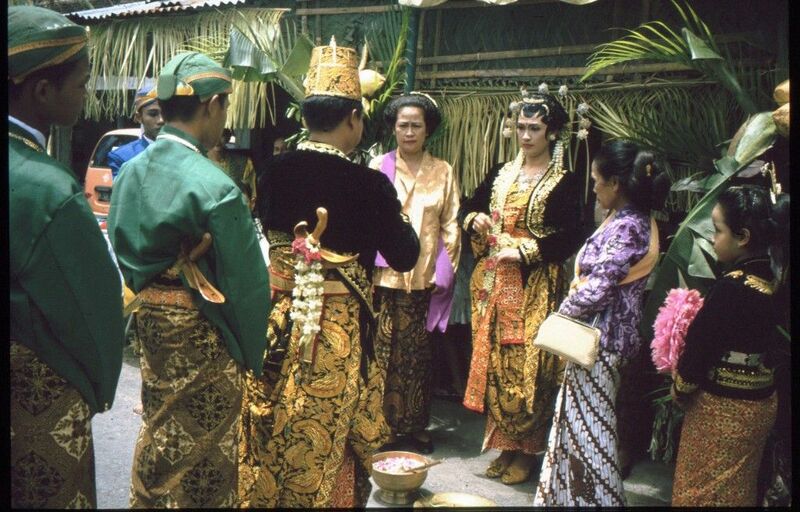 It was the first Javanese wedding I had ever been to and it got me interested in the important role batik plays at a traditional wedding. Here are a few photos I took at that wedding. This year, by a lucky coincidence we happen to be in town when the eldest of those three little girls is getting married. So, now a 21st century love story. The bride is Pingkan, a Ph.D.student in Finance at Manchester University and the groom is Adhi, doing a Ph.D. in computer science at Birmingham University. They’re both are on full scholarships from the Indonesian Government. In other words, they are intelligent and diligent young people who are moving far from their roots in the rice fields and the alleyways, and becoming middle-class citizens of the world. This family wedding couldn’t be more different from the one of 20 years ago, although some of the guests are familiar. For a start it’s taking place in a reception hall at Gajah Mada University which I’m told holds 2,000 people comfortably. We arrive at 3.30 and are among the small circle of guests invited to the official and Muslim part of the wedding – the Nikah. 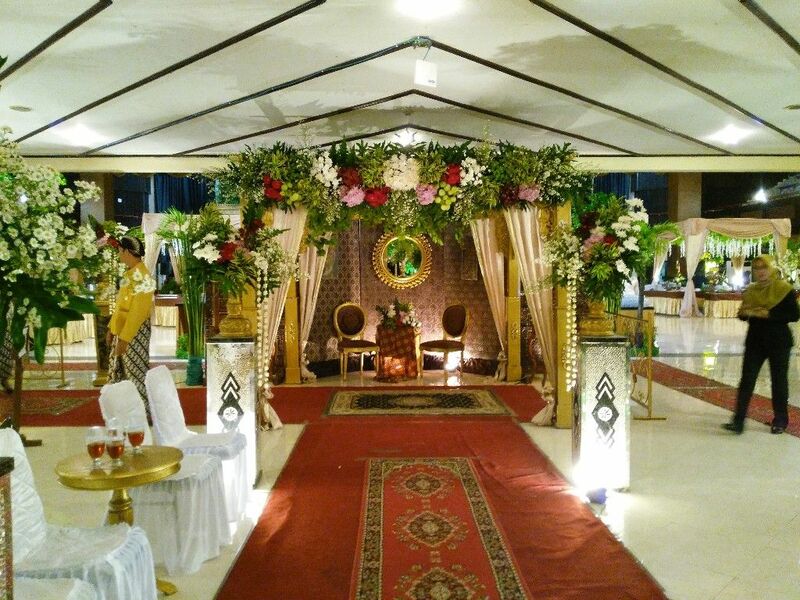 The hall is huge, awesome and totally bedecked with flowers, canopies, vignettes, room sets, pavilions and food stations. The groom comes in first followed by a procession of gift bearing relatives. The men sit one side and women the other. Adhi is taken through his responsibilities and expectations in a variety of speeches from a variety of imams. Some are heartfelt and emotional and get everyone reaching for their hankies, some are sung, some are personal, some are in Arabic, most are in Indonesian. 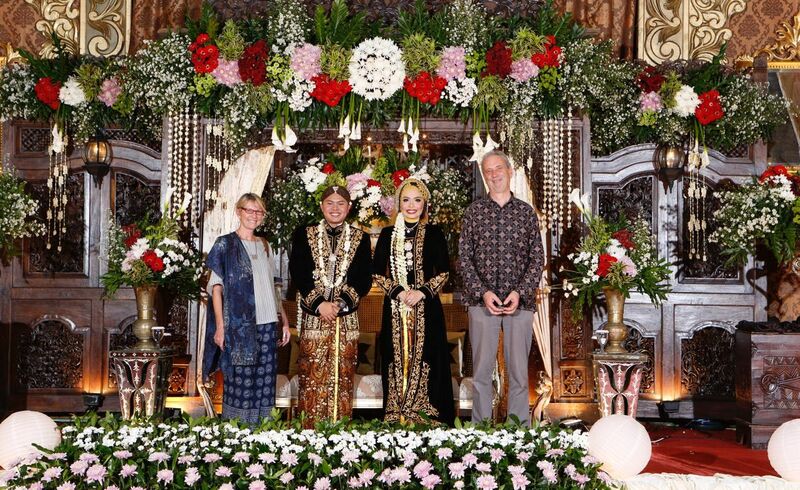 The batik count is high – the two Mums wear the same design sarongs which I find touching(“truntum with sawat” for those who are interested) and almost all the guests are wearing traditional batik. The bride finally arrives flanked by her two sisters and after repeating her name and address, a chap in black suit and kepi with the look of a young Soekarno does the official business, and the wedding is done! Photos, a bite to eat, and now just a bit of hanging around while the bride and groom get changed into another set of stunning outfits for the evening reception. The band arrives and tunes up, the caterers get going big style, the organiser and her team (headsets and clipboards) get changed from day wear to evening wear, the photography team set up their lighting and take up their positions in front of the stage. Hoards of gorgeous young women dressed up to the nines in killer heels flirt and have their photos taken with gorgeous young men in sarongs, the man with the microphone tells everyone to take their places and then we’re off for the second half. 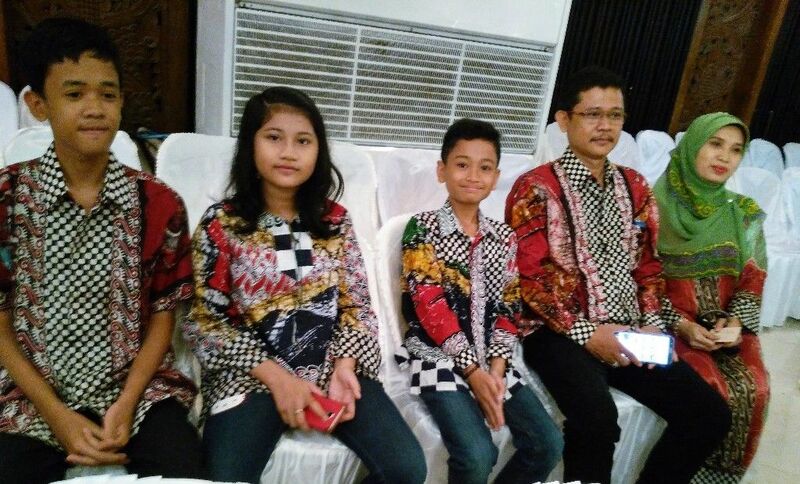 Now the invited guests start pouring in and the batik being worn is a feast for the eyes. If I felt under-dressed before, I now feel doubly so! The newly weds head up a procession of their nearest and dearest to the sound of gamelan music, and the music and the sight of them wearing traditional gold wedding cloth and velvet gold couched jackets (look at the photo at the top), and suddenly I’m moved to tears. 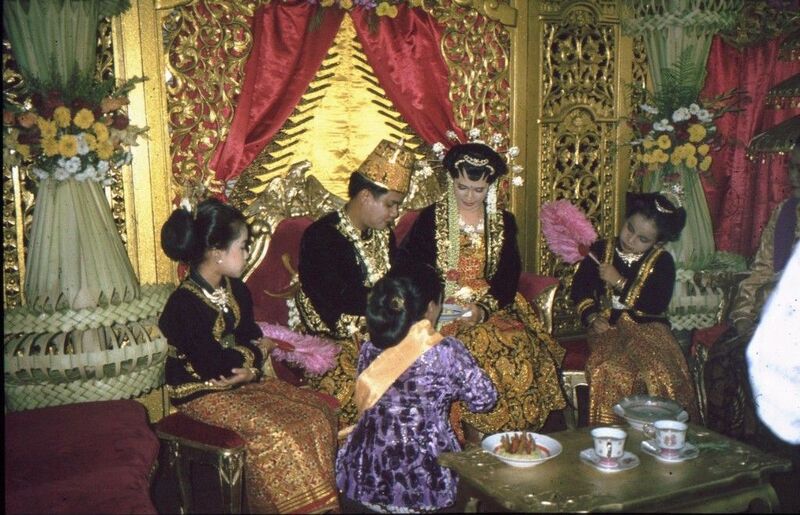 Now this is a proper Javanese wedding! We hundreds of guests slowly make our way up onto the stage to shake hands and congratulate the parents and the happy couple. After that its time to sit and eat some very superior nosh (but no alcohol of course) and compare these two family weddings twenty years apart. 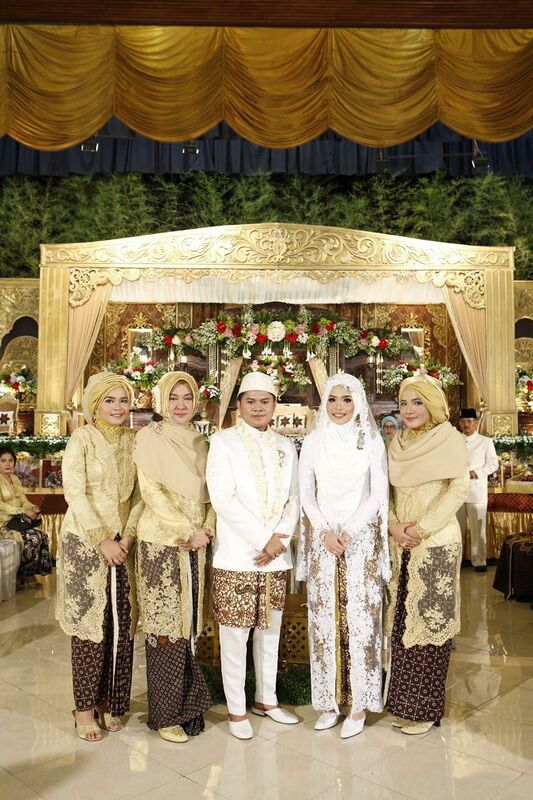 The bride and her female relatives (apart from Niken who is Christian) all wear head coverings – twenty years ago, the women wore their hair in traditional buns with elaborate hairpins. 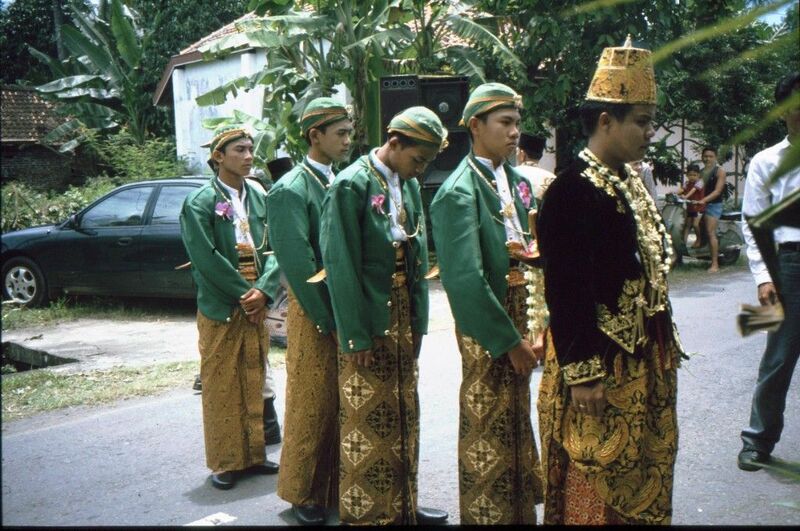 This wedding had none of the old rituals I remember either, the groom breaking an egg with his foot and the bride washing his feet before he enters the wedding, the kowtowing to parents, the mutual sharing of ritual dishes, the exchange of batik cloth. As Niken had told me, this is a modern Muslim wedding. This is a sign of how many things are changing in modern Java, the most obvious change being the increasing influence of conventional Islam. 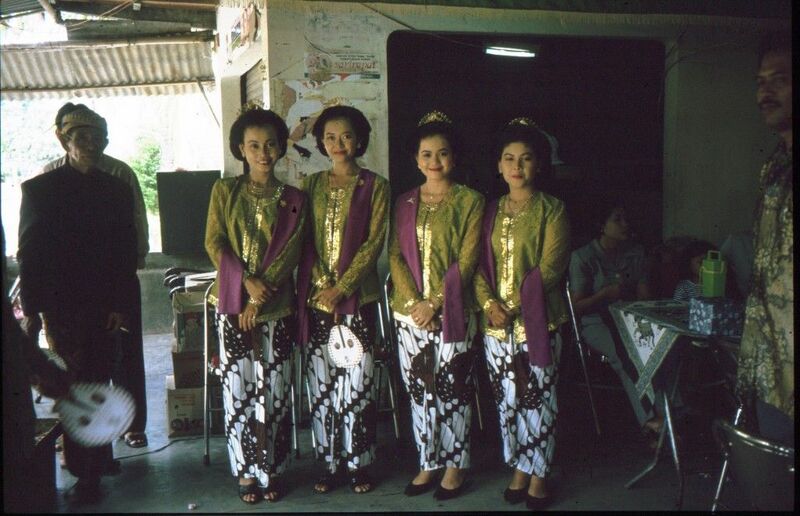 Back in the 1980s it was hardly noticeable that Java was Muslim, the call to prayer was muted, most women were bare headed and the prevailing guiding spirit at any life event was “Kejawin” a mix of Buddhism, Hinduism and Islam, the authentic home-grown spirit of Java. Thirty years later, things have changed: the mosque’s loudspeakers are never far out of earshot, the wayang, the kris and the gamelan are fading in popularity and the “jilbab” scarf is worn by more than half of women and its on the increase. Jim objects strongly to the jilbab on purely aesthetic grounds if nothing else – they’re often made of beige polyester! The other thing that’s changed is that we’ve all gone up in the world so much! We were all just little batik sellers back in the day and our kids played in the gangs, now our friend’s children go to Universities abroad, buy land and build houses and studios. We have friends who can afford to put on a wedding like this! The other change is the number of cars on the road and as we finally make our way out into the warm Javanese night, we are faced with the pressing problem of how to get home through a gridlocked city on New Year’s Eve! 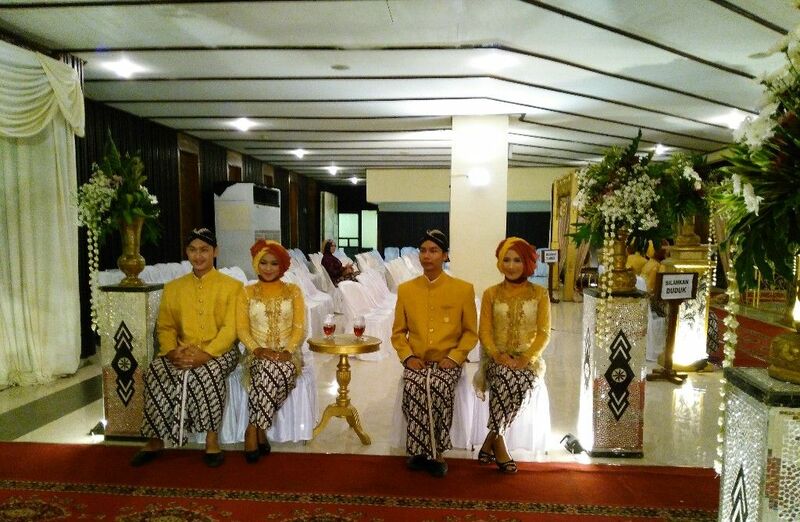 And if you’d like a look, we have some great Javanese wedding cloth on the website. The next travel newsletter will come from Laos. Jim and I are setting off to follow the Mekhong River from the Golden Triangle where we left it on Boxing day two years ago, all the way through Laos to the poetically named 4,000 islands.